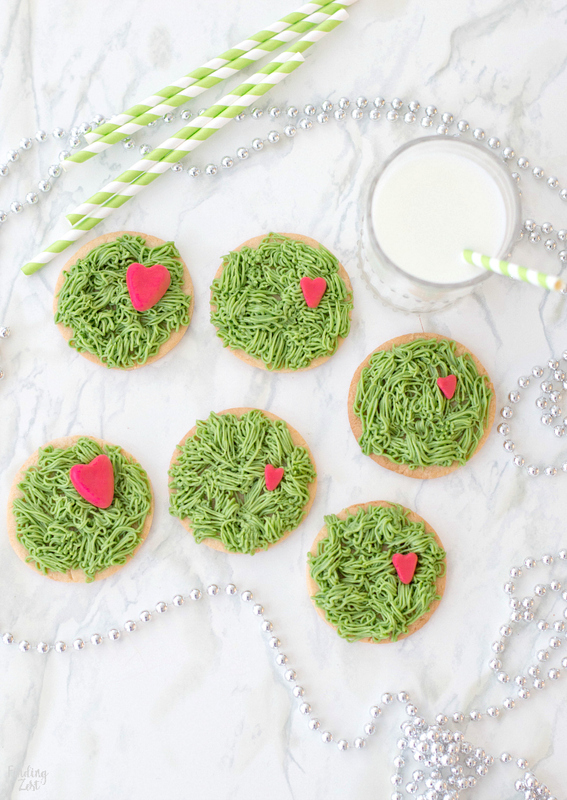 Everyone will love these adorable Grinch Cookies to celebrate the beloved Dr. Seuss character during the holiday season! 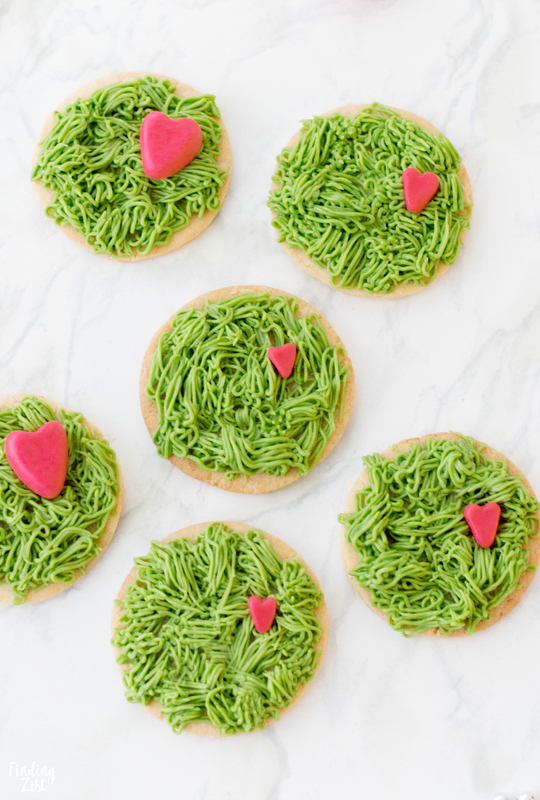 This sugar cookie features green frosting to look like fur and three sizes of fondant hearts to represent his heart growing three sizes that one fateful day. 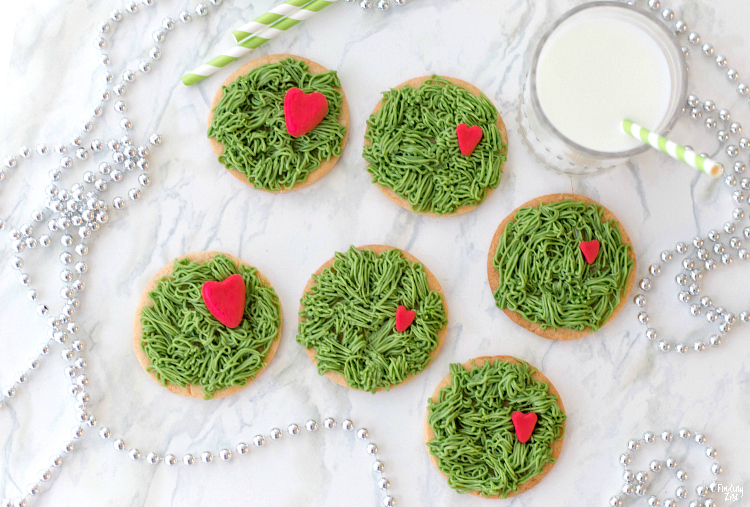 These Grinch-inspired treats are super easy and fun for all ages to make and enjoy! The Grinch holds a special place my family’s hearts during the holiday season. Besides enjoying the book, How the Grinch Stole Christmas, the cartoon was a favorite of my grandmother’s since it came out and we’ve always loved the Jim Carrey movie version as well. 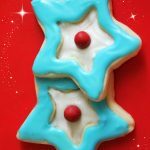 Now that a new animated film has been released featuring this rather grumpy but easy to love Dr. Seuss character, I knew I wanted to make a cookie to celebrate. Every Grinch cookie I see online is fairly similar to this cake mix cookie so I wanted something slightly outside the box. 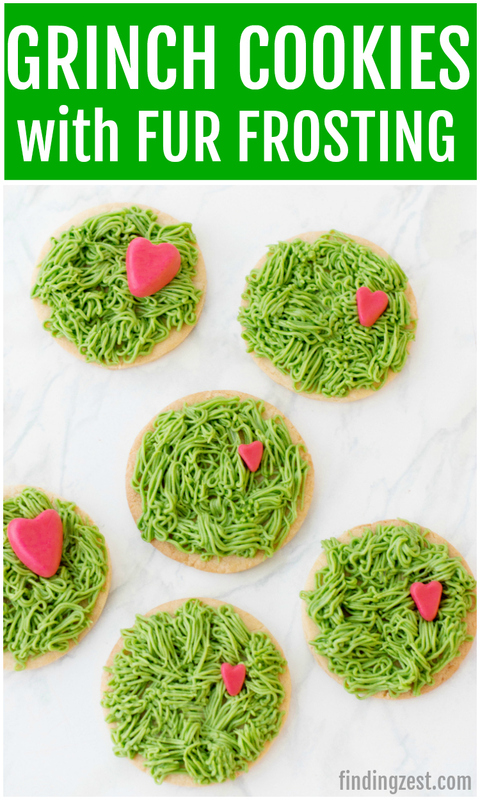 After brainstorming I thought it would be fun to to create a Grinch sugar cookie with frosting that resembled fur and with a heart that grows! 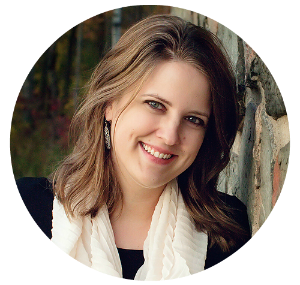 My current schedule is super full so I asked Lisa at Fabulous Habits to bring these ideas to life early in the holiday season. She understood my vision and did not disappoint! To make these adorable Grinch cookies you’ll need some easy to find supplies including a decorating bag, Wilton 233 tip to make the furry frosting, green and red gel food coloring and some white fondant. 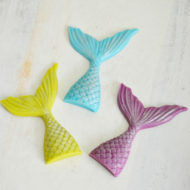 You can purchase small packages of fondant in your local craft store or even in the craft section of Walmart. Homemade marshmallow fondant is definitely the best but takes a lot more time to make. Alternatively, you could go with a jumbo red sprinkle heart on these cookies if you want to save time and skip having your hearts “grow”. 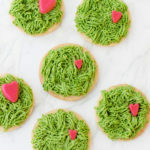 To turn your plain sugar cookies into Grinch cookies, you’ll want to mix up some buttercream frosting and add green gel food coloring until you get just the right shade of medium green to resemble The Grinch. 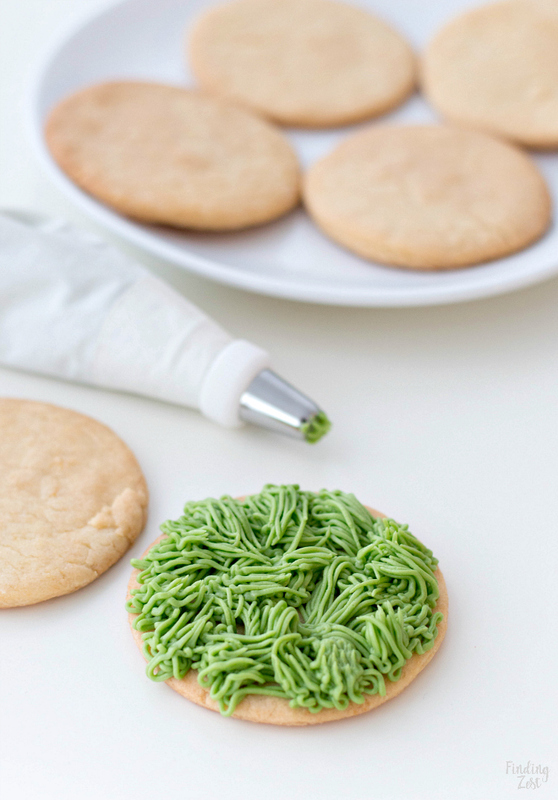 Scoop your frosting into a piping bag with Wilton frosting tip #233, commonly known as the grass tip. Pipe buttercream onto each cookie to make them look furry. Squeeze to create long lines and then pull up and away in different directions. This will give your cookie’s “fur” a disheveled look. 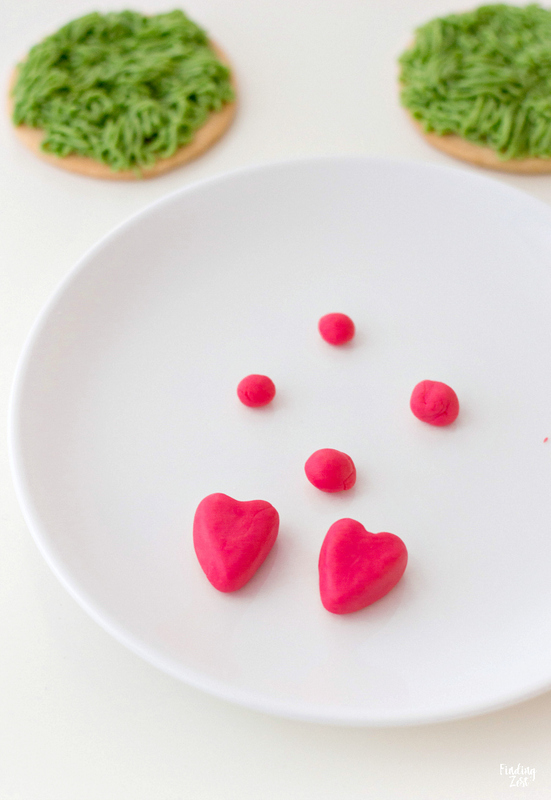 To make the fondant hearts that grow, tint your white fondant with red gel food coloring or use red fondant. Once your fondant is tinted, roll them into 12 balls. Roll 4 of the round balls to be about ½ an inch in size, the next 4 slightly smaller, and then the last 4 about ¼ of an inch in size. Fondant Tip: Use a bit of cornstarch on your fingers to avoid any stickiness. Shape each of your balls into hearts. To do so, flatten each sphere slightly and then give it a point on one end. On the opposite end, use a spoon to indent the center portion.Use your fingers to round it out and give it its final heart shape. 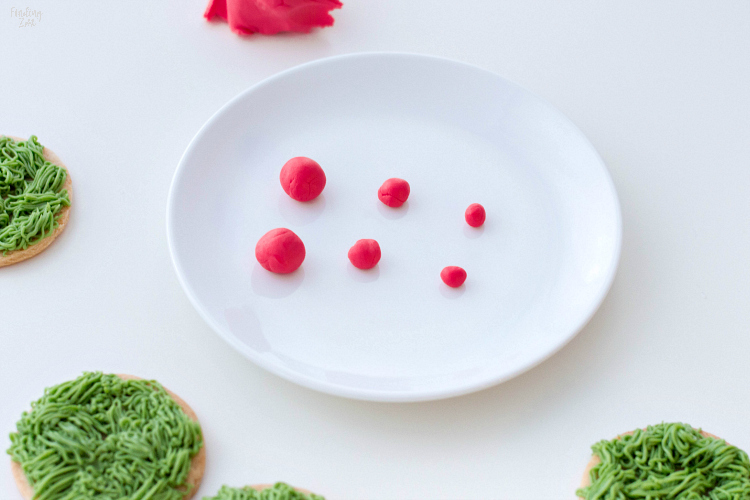 Place one heart on each cookie to represent The Grinch and his growing heart. The fondant hearts are a perfect addition to the ‘fur’ buttercream. 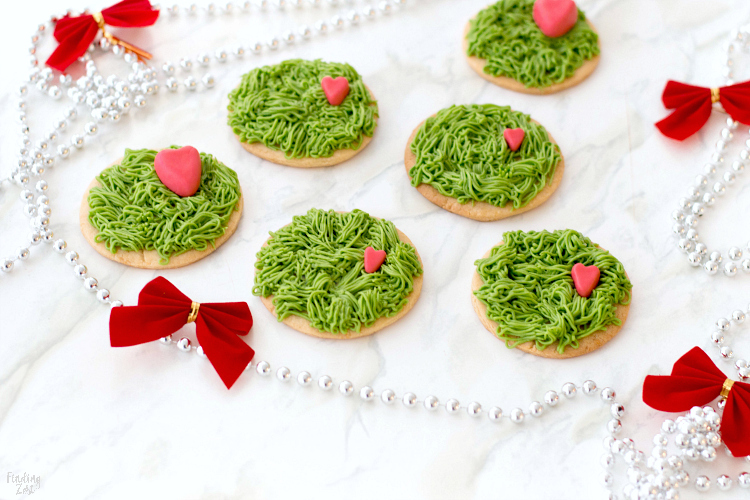 These treats are the perfect way to showcase Grinch’s story. Once you’ve baked your cookies, allow them to cool completely on a wire rack. 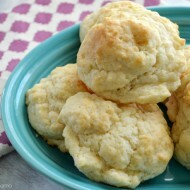 Place butter, confectioners’ sugar and milk in a medium-sized bowl. 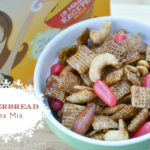 Using an electric mixer, beat ingredients on medium and gradually increase to high. 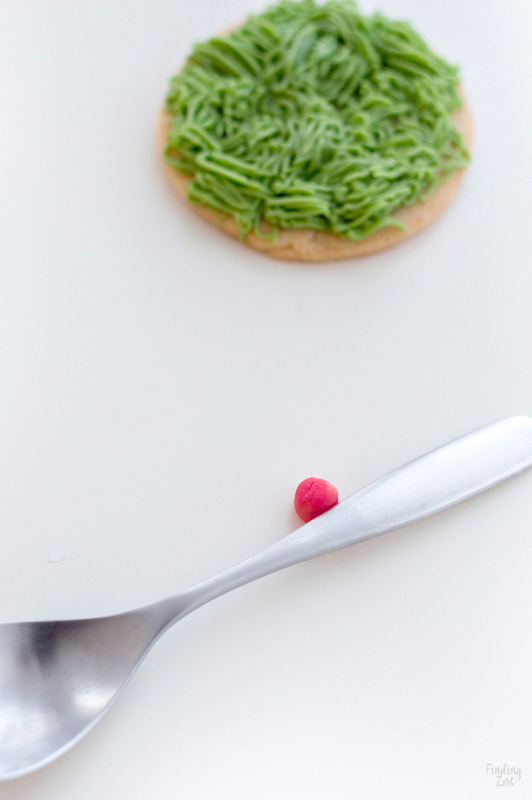 As the ingredients start to combine and mix with one another, add green gel food coloring. 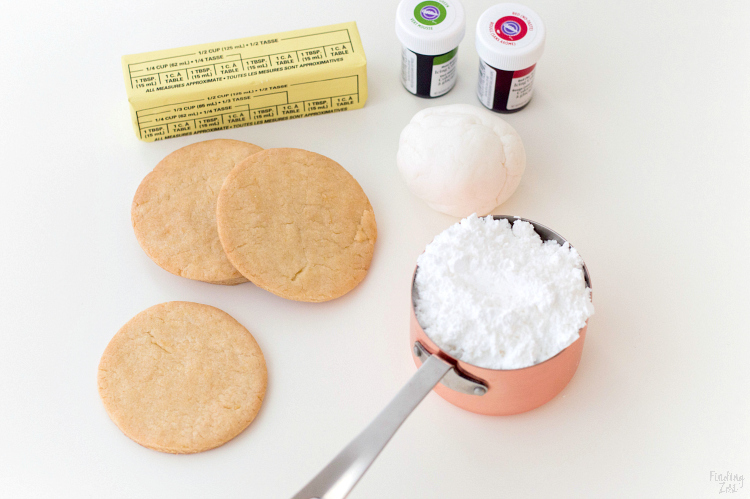 Mix until buttercream is completely tinted and scoop into a piping bag with Wilton frosting tip #233. Pipe lots of frosting on each cookie to give it the “fur look.” Squeeze to create long lines and then pull up and away in different directions. 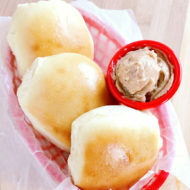 This will give your cookie’s “fur” a disheveled look. 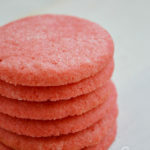 Tint your fondant with red gel food coloring (alternatively, you can use red fondant). 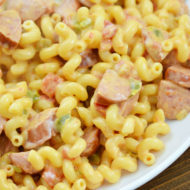 You may want to put a bit of cornstarch on your fingers to avoid any stickiness. Once your fondant is tinted, roll them into 12 balls. Roll 4 of the balls to be about ½ an inch in size, the next 4 slightly smaller, and then the last 4 about ¼ of an inch in size. Shape each ball into hearts. To do so, flatten each sphere slightly and then give it a point on one end. 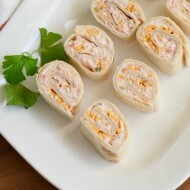 On the opposite end, use a spoon to indent the center portion. Use your fingers to round it out and give it its final heart shape. Place one heart on each cookie and serve. I hope you love these Grinch cookies as much as I do. 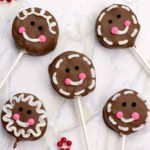 They will definitely be a hit on any sweet table this Christmas season. 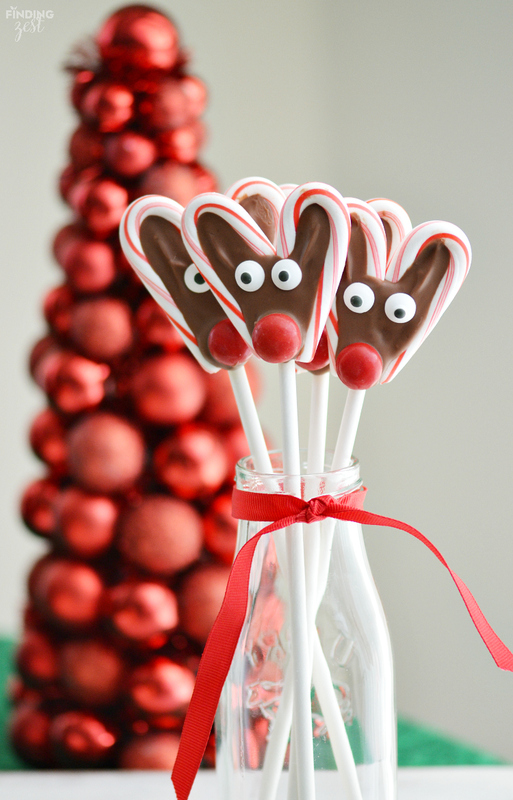 If you are searching for more kid friendly holiday treats, give these candy cane reindeer a try! How cute and I love that my daughter can help make these Grinch cookies! 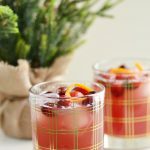 I always come here to see what cute treats for the holidays you’ll have up and you never disappoint! 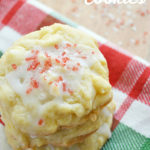 I just love these grinch cookies and know the kids will enjoy them too!